This is the second time in a hundred years the unique Tasmanian Devil has looked down the barrel of extinction. If you’re not an Australian, you are probably most familiar with Tasmanian Devil from old Warner Bros. cartoons. The real Tasmanian Devil looks nothing like that character; although it does have a similar temper :). The Tasmanian Devil is the world’s largest carnivorous marsupial; meaning that it has a pouch for rearing young. Found only in Tasmania, an island state off the southern tip of the Australia; it once roamed the mainland, but became extinct many hundreds of years ago through hunting and the introduction of the dingo – Australia’s closest thing to a native dog. The Tasmanian Devil can be a somewhat smelly and aggressive animal; but it plays an important role in the ecosystem. It is primarily a carrion feeder but is also a skilled nocturnal hunter and helps to keep down the feral cat, rodent and fox population. Black in color and standing at only around 1 foot at the shoulder, its jaws can exert the pressure of a large dog. It’s also well known for it’s speed and blood curdling screeches from which it earned its name. 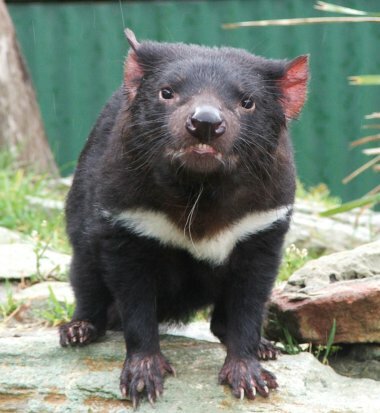 The Tasmanian Devil is a stocky creature, weighing as much as 25 pounds (12kg). It is a relatively short-lived animal with a lifespan in the wild of around 6 years. In the 1940’s, Devils nearly disappeared from Tasmania until they were granted protection. With the proliferation of introduced species in the island state, the Devil’s numbers quickly replenished thanks to their protected status and bountiful food sources. In the mid 1990’s a mysterious disease started impacting on the Tasmanian Devil, killing as much as 90% of populations. The Devil Facial Tumor Disease, a form of cancer, interferes with the animal’s feeding. Affected Devils die within six months of the lesions first appearing. The disease is transmissible and given the size of Tasmania and the devil’s tendency to roam and mix with other packs, time is running short to find a cure. In fact, in a scientific memo leaked recently, it was stated that we may lose the Tasmanian Devil from the face of the earth within 10 to 15 years. If you’re interested in making a donation to help preserve the species and research into curing and preventing Devil Facial Tumor Disease; you can do so via the University of Tasmania.